New Workflow Creates Indoor GIS Implementations from Re-purposed Building Design, Operation and Maintenance Data. When first introduced, word processing took the business world by storm. Almost overnight, people went from simple typing to saving and editing documents. Facility GIS implementations have proven similar to the advent of word processing as they have greatly expanded the capabilities of an existing technology. As facility expenses pass from development to use, existing data can also move from a point of obsolescence to full functionality. From this innovation is data development stems a BIM and CAD to GIS workflow that clears the way for massive improvements in the operations and maintenance of any facility. The capabilities of CAFM systems can be greatly improved with the introduction of Geographic Information Systems (GIS) data and geospatial technology. Both direct GIS integration and GIS to CAFM software "plug-ins" are quickly becoming readily available for most leading CAFM systems. Similarly, most common GIS software titles can perform a variety of vital facility functions "out-of-the-box", with only the addition of existing facility data. The highest level of results are seen when systems are integrated by sharing a single enterprise wide database architecture. Possibilities exist to acquire selected spatial data sets and bring them into isolated applications. Under this scenario great care must be taken to ensure data integrity. Only by immersion in a BIM and CAD to GIS workflow can the full integration of design data and facilities data be realized. What is a BIM and CAD to GIS Workflow? This workflow is a scalable methodology that is effective within any stage of a project/building/campus lifecycle. The process fashions a by-directional passageway of room location / design data, asset location / design data and facility operations records between BIM & CAD files to GIS applications. The workflow begins by determining detailed CAFM objectives that will shape a data flow structure between a GIS and BIM/CAD data. These objectives also define additional upstream requirements that must be considered at the earliest stages of project development. Data collection, selection, normalization and standardization are successive stages and all play a decisive role in a workflows success. Transitioning data from the BIM and CAD world into GIS is not the final phase of the workflow. Database development, whether at an enterprise level or solution specific, allows GIS the ability to efficiently access data for analysis, visualization and editing. Nearly every facilities GIS data requirements are varied. Using even the most simple of GIS data with “off-the-shelf” GIS software can yield good results. Integration with GIS capable CAFM solutions, the development of enterprise wide GIS server solutions, and custom application development, represent the most effective approaches. An Indoor GIS provides a much more formidable decision support tool than a facilities management system because most CAFM systems lack the location based functionality of GIS. A BIM/CAD to GIS workflow ensures that as-built project components, parameters and attributes, authored during design and construction, directly and automatically populate relative GIS features and attributes. Feature Representation - GIS stores XYZ geometry in real world coordinates, thus any object, function or event is referenced by its actual location. Physical features such as rooms, spaces, personnel, departments, buildings and connections to the outside environment are displayed in the form of 2D and 3D models. Parameter / Attribute Storage – GIS is an information aggregator. The subject matter of most facility information centers on data location. Storage of, or connections to, live and or legacy data, enables GIS to associate like parameters and attributes with like features. Underlying Database – GIS brings together feature and attribute data. It may be on a local machine, enterprise-wide or even exist in “the cloud”. The database may be seamless and rudimentary or it may be something capable of completing massive amounts of transactions in short periods of time. The functional possibilities of GIS are impressive and revolve around its ability to integrate, store, edit, analyze, share and visualize anything related to a location. 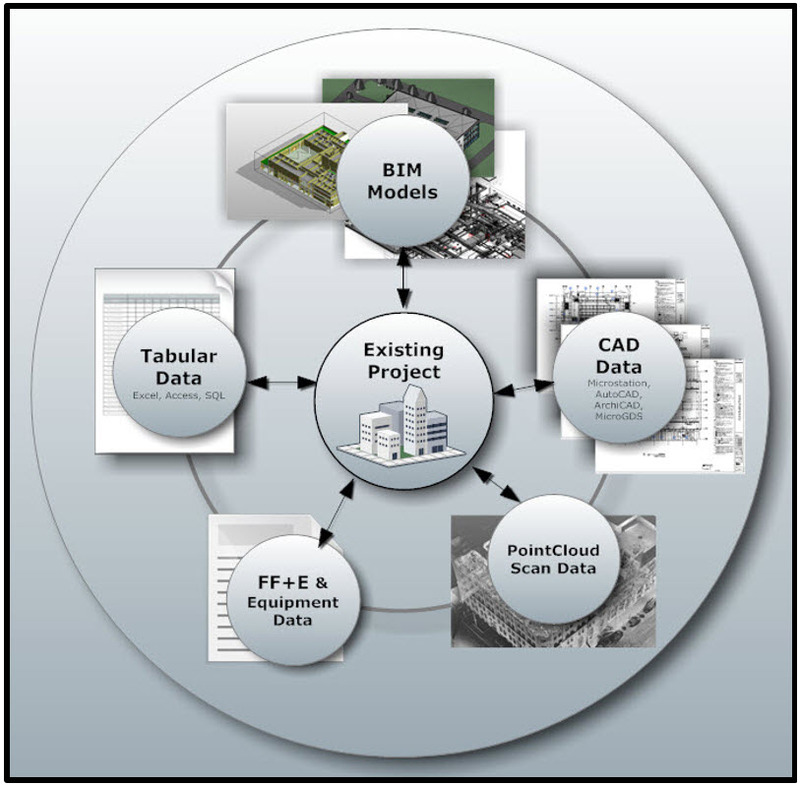 Directly integrating BIM/CAD data ensures data integrity across BIM/CAD and GIS models. GIS has long been a champion of identifying, assembling, merging, analyzing and importing an assortment of formats into a project. 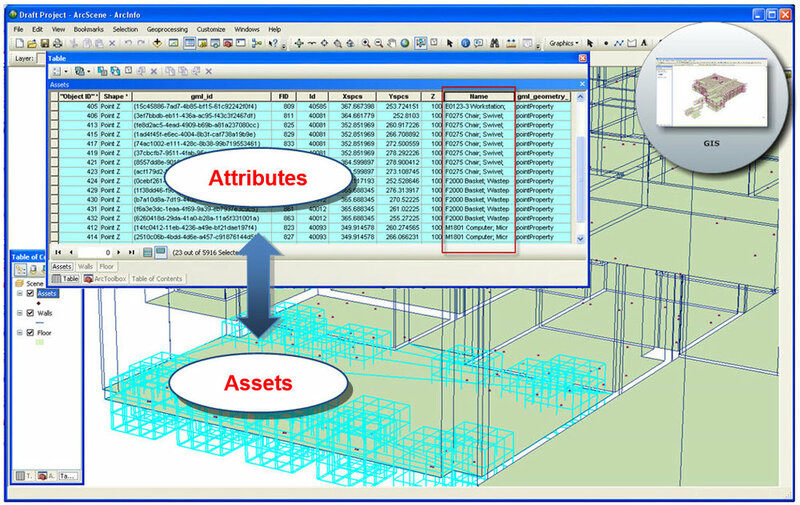 All types of BIM and CAD data as well as data associated with CAFM systems can share the GIS platform together. A GIS will access and display multiple formats, convert geographic projections on the fly, filter geometry and read/write to multiple databases concurrently. GIS systems’ powerful database and editing tools are hardwired for the automated assignment of codes, attribute values, rich media, and specifications, all in the context of precise coordinate locations. When BIM/CAD data is exposed to GIS, then linked with existing facility records, it becomes an invaluable management tool. Precisely dimensioned and geo-positioned walls, floors, rooms and assets provide a springboard for the dissemination of facilities information. For a BIM and CAD to GIS Workflow to be cost effective, it demands a precise and streamlined method for data transmission. A properly constructed database schema is a receptacle for existing facilities information and BIM/CAD data that has been converted to GIS. The schema acts as a conduit for bi-directional data input and storage, resulting in an effective database normalization and standardization routine. What Facility Data Would a BIM and CAD to GIS Workflow Use? Facilities can look towards current and past operations, maintenance and utilization records, as a source of GIS data, as all relate to known locations. Up-to-the-minute facilities as-built design data should always be considered an appropriate data source, no matter the media in which it resides. Built environments are constantly evolving and facility applications are most dependable with fresh data. Perhaps the richest resource lies in legacy design data. It exists in many forms ranging from CAD/BIM models, hand drawings, specifications, cut sheets, point clouds and spreadsheets. The same is true for design authored data and contractor as-built data. All of these data sources can contribute to a full-life cycle project involving GIS. When it comes to BIM and GIS integration, more is not necessarily always better. BIM tends to have very large file sizes. Having the capability to carefully select only the data that is necessary allows for fewer conversion errors, a better understanding of the content, and the quickest route to project productivity. In AEC as well as GIS, many organizations have widely distributed data repositories. Each holds diverse formats and types often emanating from various platforms. Though difficult, channeling the flow of these disparate data sets into a manageable reservoir can be achieved. Ideally, a BIM and CAD to GIS workflow is only fed well-documented and actionable data for conversion. Only with an informed understanding of what needs to be addressed in a facility can selection be properly undertaken. In addition, one has to consider the software, hardware and database capabilities that will support these data sets. BIM file sizes can be massive and filled with tremendous amounts of information that may simply not be a required component of the GIS tool set. By utilizing the BIM models as authoring and reference tools, GIS can house, manipulate and analyze as-built data without the limitations of the design based authoring tool. Only data relevant to Facilities Management is extracted and pushed back into the design/as-built models as needed for further design authoring. Handling excess BIM and non-pertinent facility attributes can cripple the best planned and executed workflow. 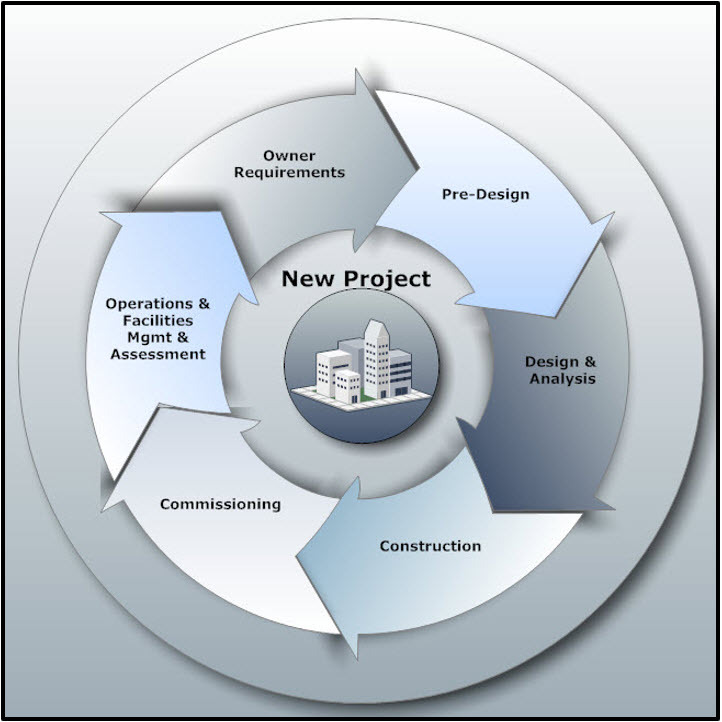 BIM data flows throughout the full project lifecycle. With each phase it matures and its value increases. These robust data sets are ideal candidates for transition into GIS data formats such as Geodatabases. Pre-design, documentation construction and as-built data provide a rich source of facility information that is directly applicable to facility GIS applications. Under this workflow, data may flow bi-directionally from the GIS Space to the BIM space. BIM data needs to be geometrically correct and its features need to represent the actual, “real world” positional coordinates. A key consideration when looking at facilities management data is the native file format and quality of data entry. Incorrectly populated entries can have major effects on applications usability. Traditionally, migrating BIM data to a GIS environment was arduous and required lengthy and complicated QA measures to ensure the integrity of the data throughout the steps of BIM to GIS data conversion. The absence of a well-defined process has left useful data to remain untapped and also has generated some poorly constructed data sets. This workflow offers some data development alternatives which provide efficiencies in time and quality. What Facilities Management Systems Integrate with GIS? What Can GIS Do For Facilities? Oversees utility infrastructure and network relationships: water, electrical and sewer. Search for and map any asset by attribute: building, space, room, floor, owner, type, maintenance interval etc. Building a GIS is not an overnight matter. It requires planning, expertise and an outlay of resources. This paper offers a general discussion without technical descriptions and in-depth analysis. Successful implementations involve more than the cursory topics found in this paper. With GIS, success requires contributions from many areas. Of the five components of GIS, ‘people’ ranks the highest. Issues may arise from all sides of project; these must be matched with people who are surefooted enough to solve them. The most productive GIS occurs when experienced practitioners work alongside those interested in GIS to form a knowledge base and actionable process which centers on the five components. Developing a team of this sort can be a challenge because the ability to execute a BIM and CAD to GIS workflow followed by implementing a GIS demands a specific knowledge and commitment. In developing and putting into practice this workflow and facility GIS methodology, CDV Systems and its partner company PointLinePoly have acquired the specific knowledge and experienced required to carry the BIM and CAD to GIS workflow through to completion.